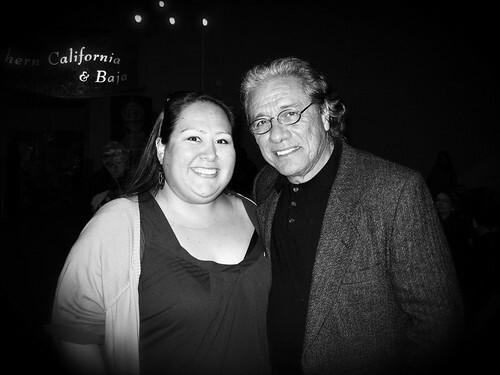 Edward James Olmos is such a wonderfully passionate and down to Earth man. He posed for photos with everyone who asked him at our night event Sunday night (Noche de Estrellas). We presented him with the Aquarium of the Pacific’s Heritage Award for his ocean conservation and education efforts. I did the Spanish-language speaking for the award presentation, so that means I was up on stage with him and at one point, he gave me a kiss on the cheek. He shattered any expectations I had of him. I had hoped that he was a nice guy, but he was beyond that. He showed up with a posse composed of as much of his family that could show up; sons (including “Hot Dog”), aunts, grandkids, even his 80-something year old mother. In his acceptance speech, he gave such mad props to her and got so emotional and even teary-eyed, it was hard for me to not lose it on stage. After the award presentation, he sat with his family and had dinner (eventually, after he took a ton of photos). I had to do a little more running around (did a quick bilingual dive presentation at Tropical), but eventually, Juan and I hit the dance floor for a couple of songs. Our good friend Jesus of DJ Quinto Sol DJ’d the event, so the music was great. What was awesome was that Mr. Olmos and his wife would get up and dance too (at one point, he was so into it he even stepped on me, hahaha) so it felt like a big party. His birthday is on Wednesday, we all sang him “Happy Birthday” and he sorta celebrated with us. I thought I was a fan before, but I am a FAN for LIFE now. ETA: Juan emailed me a link to the news. Look at me failing to get out of the way on the cramped stage! Hahaha! 5 Responses to "Noche de Estrellas"
Wow, that’s awesome! He always came across as nice to me, but this is fab to hear! Glad you had such a great night! OK, Remember that I haven’t lived in the US for AGES. OMG! I haven’t seen him in YEARS! Doode! I feel so old now. Me being squashed on the stage is pretty much all there was of me on there. It was the big moment of giving him the award and I was just a translator, not an actual participant, so I tried my best to get out of their way for the official photos.